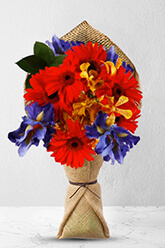 This collection of richly coloured blooms has the feeling of exotic royalty. It is bursting with contrasting red Gerberas and blue Iris, with the added touch of exotic Asian orchids. This is sure to warm the heart of your special someone, whether they are the love of your life or a friend you want surprise.Vase not included however, we suggest including a Superior Vase with your gift to dazzle the recipient even more. Just tried to order more flowers for a future date but the invoice keeps coming up with delivery for today!